Copper Kettle Brewing Company is turning 1 year old this month. Has it been a year already? And to celebrate, they are planning to host a huge celebration starting April 19th and lasting through April 22nd, 2012. To start things off on Thursday, April 19th at 3pm, they will be releasing their Belgian Golden Strong ale. The food truck of the day will be Doimoi Dumplings and they will be serving up their famous potstickers with a variety of sauces from 5pm to 9pm. Live music will be on hand with "Lizzie Huffman" on acoustics doing some folk songs from 7:00pm to 9:00pm. Then on Friday, April 20th, Copper Kettle will release another beer, their Belgian Black Quad at 3pm. Stop in for a taste along with some food from Biker Jim's Famous Dogs from 5pm to 9pm featuring dogs made from reindeer, elk, rattlesnake and more. Live rock music will feature "Whole Lotta Nada" on acoustics starting at 7:00pm and running til 9:00pm. Kicking into the weekend on Saturday, April 21st, Copper Kettle will pop their Anniversary Barleywine at 12pm and feature biscuit sandwiches from The Biscuit Bus from 5pm to 9pm. Eat and drink while listening to "The Acoustic Mining Co" play their medley of bluegrass music under a full size tent from 7:00pm to 9:00pm. Then finally, on Sunday, April 22nd, Copper Kettle will release their 4th beer of the week with their Bourbon Breakfast Stout - a 10 gallon cask that is sure to drain fast starting at 5pm. Pair that with fixings from "Uber Sausage" from 5pm to 9pm and listen in to "Pete Stein" and his alternative country style on acoustics from 5pm to 9pm. 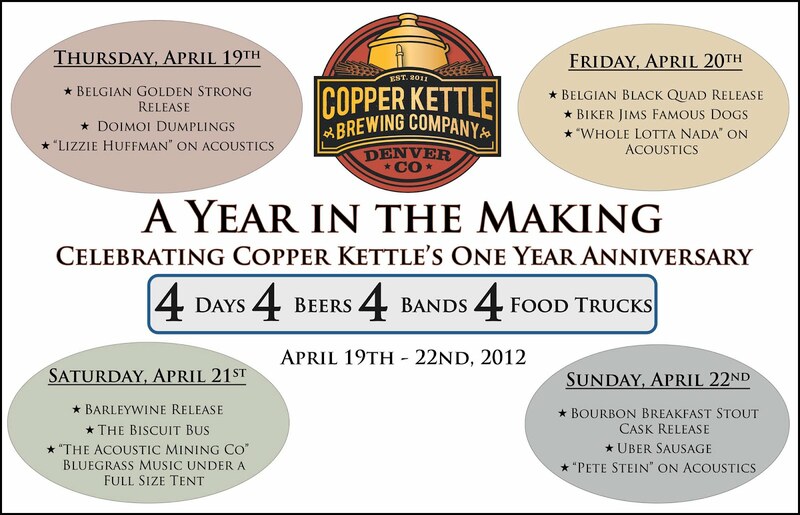 It's a big 4-day weekend celebration at Copper Kettle Brewing Company. Be sure to stop in for at least one day of this celebration (or all 4 - they won't mind). - Oskar Blues celebrates a 9th CANiversary (2011). - Upslope Brewing throws a 3rd Anniversary Party (2011). - Fermentedly Challenged turns 4 years old (2001).